The funeral service for Genevieve L. Walker, 89, of Alden, will be at 11 a.m. Tuesday, March 26, 2019 at Redeemer Lutheran Church in Alden with visitation one hour prior to the service. Burial will be at Alden Cemetery. Online condolences are welcome at www.bayviewfuneral.com. Genevieve died on Sunday, March 24, 2019 at Chev’s Place in Rogers, MN. Genevieve Lucille (Marsh) Walker was born on February 20, 1930 in Alden Township, Minnesota the daughter of Kenneth H. and Josephine F. (Kinseth) Marsh. Baptized in the Lutheran faith in 1942 by Pastor De Haan at her parent’s home along with her sister, Virginia and brother, Kenneth. Genevieve attended Alden Schools for 12 years graduating in 1948. Genevieve was united in marriage to Franklin James Walker on February 26, 1949 at Grace Lutheran Church in Alden. They farmed together in the Alden area until 1984 when they retired and moved to Albert Lea. 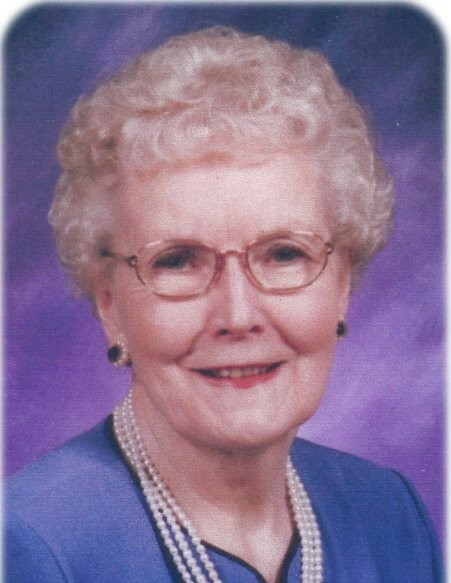 Genevieve was active for many years at Redeemer Lutheran Church as a Sunday School teacher and organist. Genevieve enjoyed “Walker Week” family vacations, farming with Franklin, playing piano, playing cards, sewing, painting, decorating, baking for her family, watching her children and grandchildren in sports and other activities, and visits from her family. Survivors include children: Alan (Elise) Walker of Amery, WI, Kerry (Ned) Froehlich of Maple Grove, Barbara (Paul) Kujak of River Falls, WI and Beth (Marty) Heimer of Kasson; grandchildren: Andrea (Steven) McMaster, Jon (Leah Findlater) Froehlich, Margot (Joshua) Harris, Nathan (Katherine) Walker, Michael (Christine) Kujak, Amy (Chris) Berger, David (Maycee) Kujak, Zachariah, Jacob, and Lucas Heimer; 16 great-grandchildren; sister Virginia Lepage, sister-in-law Joan (Harold) Germann; cousin Suzanne Abbe, and several nieces and nephews. Genevieve was preceded in death by her husband Franklin, parents Kenneth and Josephine, brother Kenneth (Jody), sister-in-law Lorraine Provo, and brothers–in-law Donald Provo and Robert Lepage. Genevieve’s courage and strength were an inspiration to all who knew her. She had a deep and personal Biblical faith in the Lord Jesus Christ that she shared with her family. Her love and wisdom will live on in the memories her family will share together. Memorials are preferred to Redeemer Lutheran Church, Alzheimers.org, or the charity of the donor’s choice.